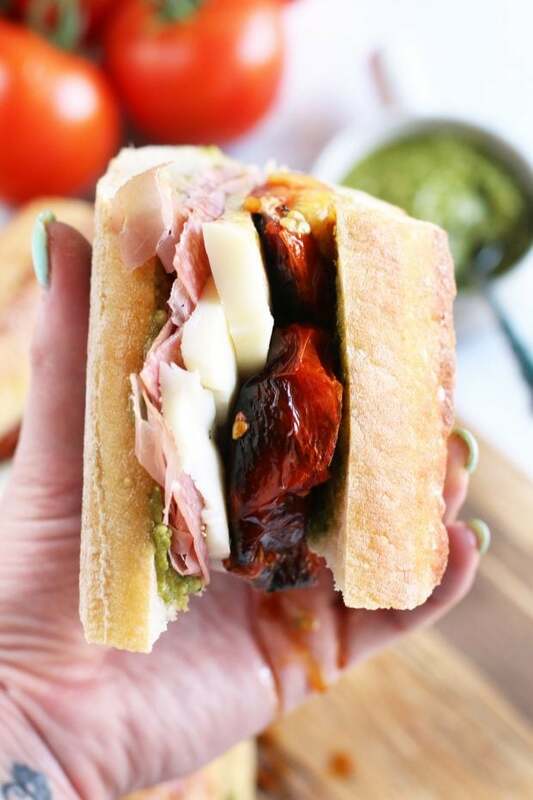 A Grilled Tomato Italian Grinder Sandwich is just the thing you need to stuff in your mouth this week. 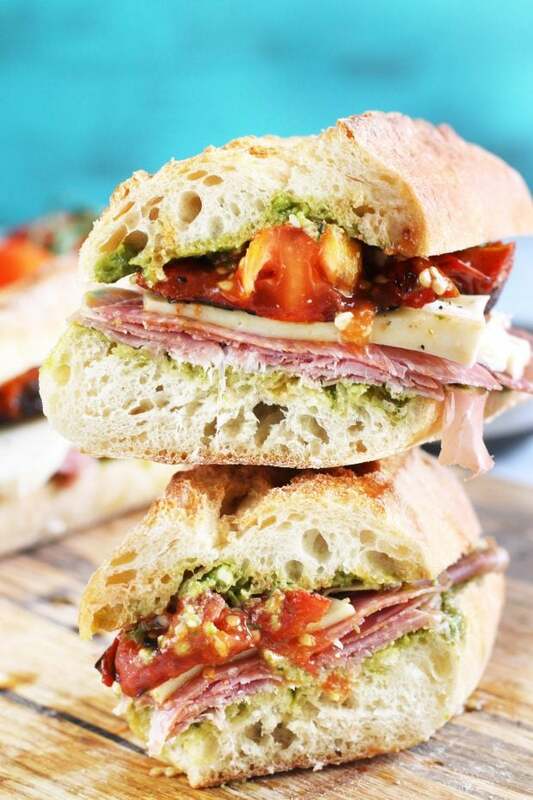 Layers of thinly sliced meats and mozzarella are paired with homemade grilled tomatoes and stacked high on a crusty loaf spread with basil pesto. Pack it up and bring this bad boy to your next picnic! It doesn’t matter if you call then grinders, heros, bogies, subs, or whatever ever other word you use for a submarine style sandwich. 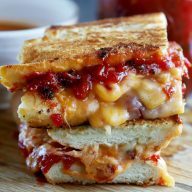 If you love to bite into a thick, stacked sammie layered with a variety of layers, you are going to fall head over heels for this ridiculously tasty recipe. Sandwiches are one of my favorite things to eat, aside from burritos. It’s handheld, you can do so many things to it to make it different, and it pairs perfectly with a crisp, chilled beer. That’s what we all need this summer, isn’t it? 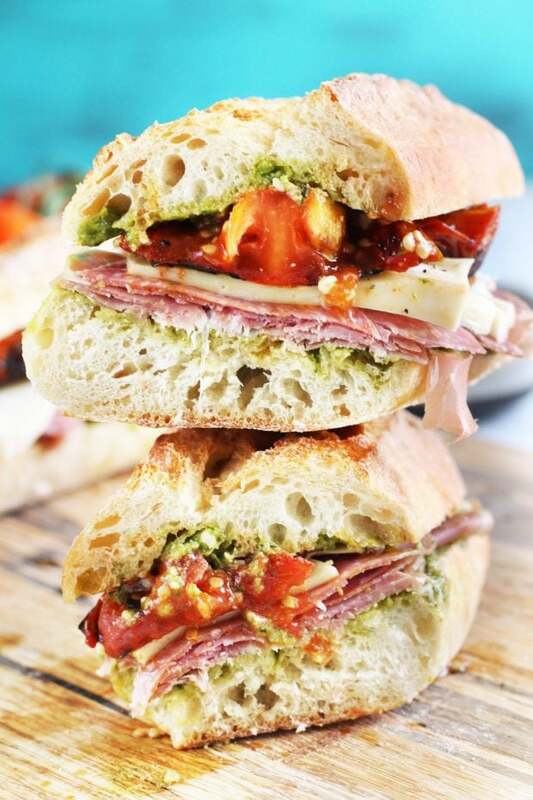 This particular Italian grinder sandwich is stacked with some Italian flare. It starts with a crusty loaf of your favorite bread (I prefer a baguette from my local bakery) that’s been slathered with fresh basil pesto. Then you start layering on the meats. 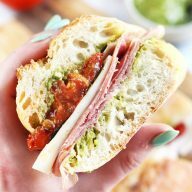 I love salty prosciutto and a spicy salumi combination because it really packs a punch and stands up to the flavor of the basil pesto. After that, you gotta have the cheese which obviously needs to be mozzarella. Because what comes next is what really sets this sandwich apart from others. I LOVE grilled or roasted tomatoes. When they get all shriveled and warm, their flavor is multiplied by 500%. Plus, they get this tinge of sweetness to them that you just don’t get with a plain sliced tomato. The whole combination is full of flavor, textures, and you just want to swoon over every lovely mouthful. My favorite thing to do with this sandwich is to heat up some marinara sauce to pair with it. Dipping the chilled sandwich in the warmed tomato sauce gives you a temperature combination that’s so intriguing. You might think that will be too much tomato for the sandwich, but it really isn’t. The grilled tomatoes give you the freshness, and the tomato sauce gives you some warmth. It’s just SO DANG GOOD. to cut into that crusty bread with ease.
. It has changed my life and is pure perfection. 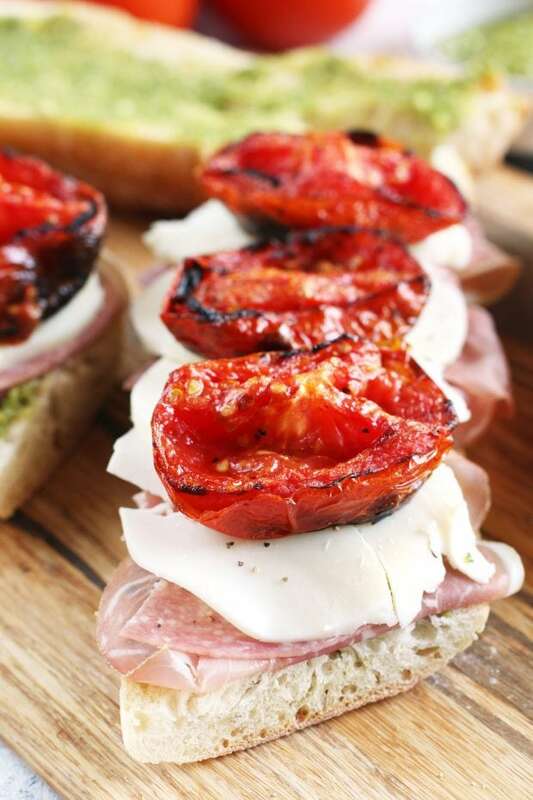 for grilling the tomatoes because it gives just a hint of extra savory flavor to them. 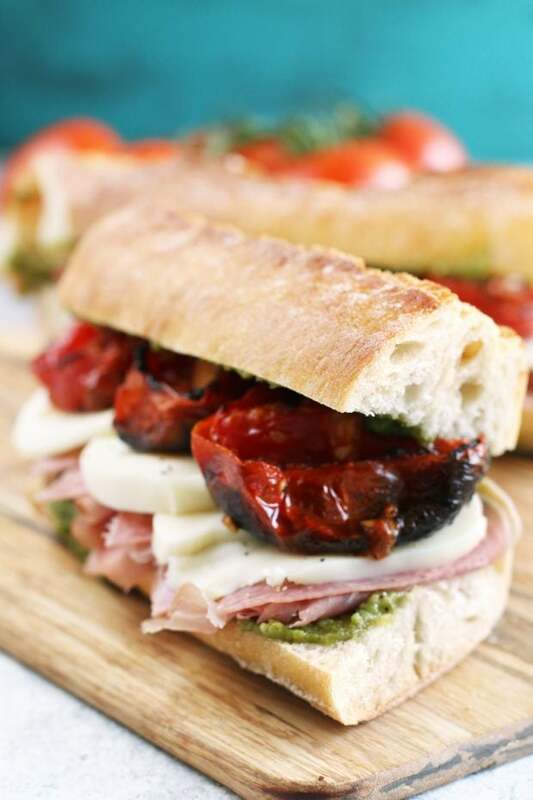 Catskill Craftsmen 30-Inch Pro Series Reversible Cutting Board so you can slice the cheese, tomatoes, and whatever else you are diving into outside of this Italian grinder sandwich. 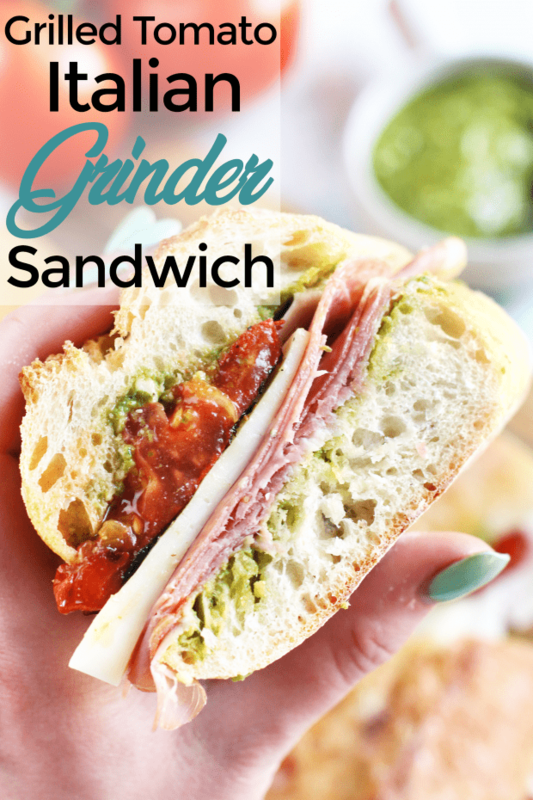 Pin this Grilled Tomato Italian Grinder Sandwich recipe for later! 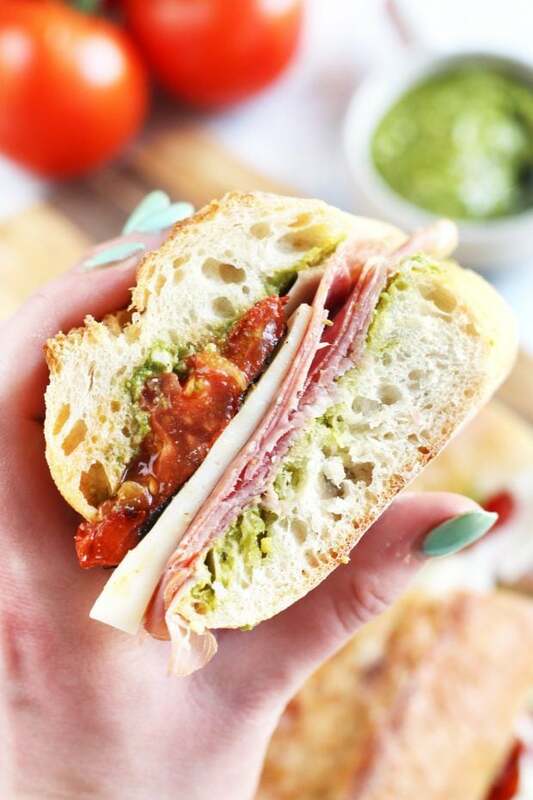 Delicious meats, grilled juicy tomatoes, basil pesto, and mozzarella are all it takes to make this grinder sandwich pure perfection! Spoon out the pulp of the halved tomatoes. Add the pulp to a bowl with the olive oil, salt, and pepper for the grilled tomatoes. Smash the ingredients together with a fork to combine. Set aside. Sprinkle the seeded tomato halves with a little more salt and an extra drizzle of olive oil. Add tomatoes, cut side down, to the wire rack and cook for about 15 minutes. Flip the tomato halves and spoon the pulp mixture over the them. Cook another 15 to 20 minutes. They should be shriveled and cooked through. Primarily you want to make sure that they've reduced in height by at least half. Cut the loaf of bread into two 9-inch pieces. Slice each piece of bread in half laterally. 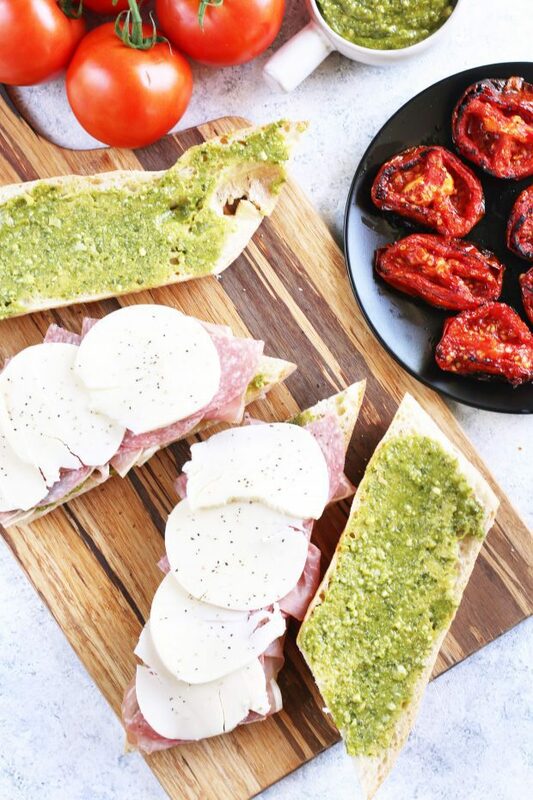 Spread the cut sides of the bread with the pesto, dividing evenly between the four pieces. Layer the bottom halves with equal amounts of prosciutto and salumi. Top with mozzarella slices, then three tomato halves each. Finally top with the other halves of the bread. Serve immediately or keep wrapped in aluminum foil in the refrigerator until ready to serve. You can totally make these sandwiches the day before! Just make sure you get a nice, crusty loaf of bread so it doesn't get soggy.